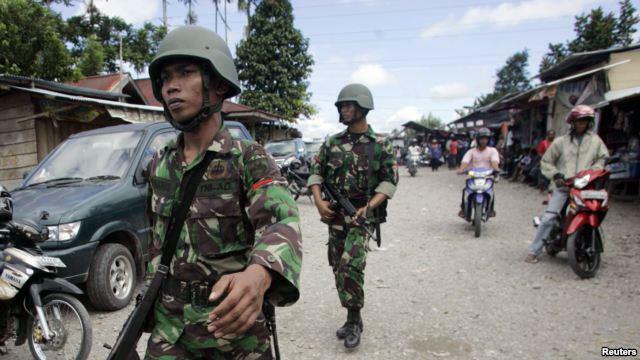 Major Reprisals begin with house to house searches, village and church burnings in Tingginambut by Indonesian Security Forces after TPN shoot dead 8 Indonesian special forces soldiers. Local communities around Sinak, Gurage, Mulia and Tingginambut in Puncak Jaya regency have felt the first effects of Indonesian military reprisals, after West Papuan independence guerrillas under General Goliat Tabuni confirmed that they had killed eight Indonesian special forces soldiers and four non-Papuan civilians on February 21 in two separate incidents. The shootings were carried out after Kopassus officers continued to build military posts on a local sacred burial site, despite being requested not to by both community representatives and emissaries from the West Papua National Liberation Army (Tentara Pembebasan Nasional Papua Barat – TPN-PB) under Tabuni. TPN spokespeople have said that the shootings were done “to assert West Papuan sovereignty against Indonesian colonial occupation”, and to assert West Papuan cultural rights to defend their customary practices against ongoing military brutality. A spokesman for the Goliat Tabuni’s TPN-OPM command, Nikolas Tabuni, told West Papua Media in a statement that the killings were not without cause. “Prior to the incident TNI had wanted to make a military post in the region of Tingginambut and the TPN OPM had sent a letter to the TNI asking them not to’ go ahead with the military post construction at Tingginambut. As that is an area of which the land is formally claimed to be owned by the TPN OPM, and as it is also a sacred area under indigenous customary law of the indigenous community of that area. However TNI disregarded the request (in principle) and continued with the construction. As a result TPN OPM carried out the shooting on 21 February,” the statement read. Despite an effective information blockade imposed by thousands of Indonesian army (TNI) troops and Police, and unchallenged by a compliant Jakarta-based colonial media, detailed reports are beginning to filter through from independent sources in the area of the military offensive, painting a vastly different picture to that reported by Indonesian and international media since the shooting of the Kopassus soldiers. At least 1000 members of various Indonesian security forces are currently occupying and laying siege to entire communities around Puncak Jaya, with thousands more troops being sent in from other centres in Papua, according to local church, human rights, and sources in contact with West Papua Media stringers across the conflict area. According to these sources, the villages of Tingginambut, Trugi and Nelekom have been occupied by TNI forces since Sunday February 24, with villagers being forced to give all their food and houses to soldiers, and being subject to arbitrary and harsh interrogations. TPN sources have also stated that troops are using the villages as strategic hamlets to prepare for a hunt and destroy mission to flush out the forces of Tabuni, who have claimed they are well prepared for guerrilla defence. 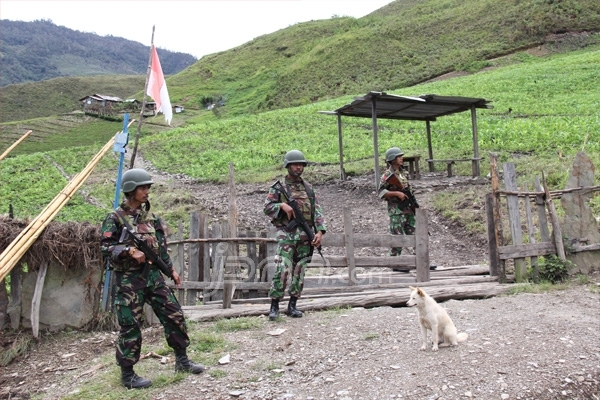 In Nambut and Gurake (Gurage) villages in Sinak District, security forces began to carry out house to house sweeping operations on February 26, and in villages in Tingginambut, Puncak Jaya. According to our sources, the TNI Commander in the area has commanded “that the sweeping operation is to be continued until the culprits from last Thursdays killings are arrested”. 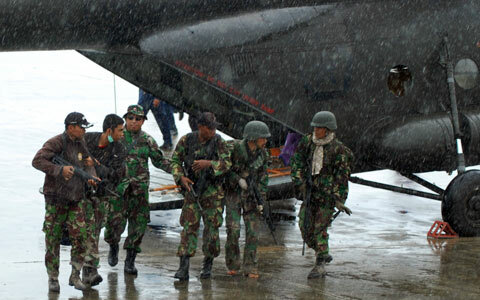 The TNI have stated to local people they “need to see 11 persons sentenced,” according to the reliable source. Two civilians were said to be arrested on February 27, according to Indonesian military reports, however independent sources could not confirm if any other civilians have been arrested. As of February 26, at least 18 houses have been burned to the ground, 5 GIDI churches razed, 2 schools and a library have been destroyed by the combined Police/TNI forces in Tingginambut, according to reliable church sources who have safely relayed data from witnesses to West Papua Media stringers. Witnesses have also reported that soldiers are deliberately burning and destroying food gardens and shooting livestock, including over one hundred pigs. There are fears of a major humanitarian disaster unfolding with the reports of the destruction of food gardens and livestock, an act of collective punishment on a civilian population. Thousands of people from the surrounding villages have fled to the high mountains and according to church sources, the entire community populations have fled throughout the area of Gurake, Sinak, Tinggi Neri, Trugi and Nelekom. Exact numbers are not currently known but local sources indicate that several thousand people, mainly subsistence farmers, live in the area. Human rights workers have also reported from Mulia in Puncak Jaya that townspeople are greeting news of the offensive with panic and preparing to flee. Reports are difficult to verify as the only media personnel allowed into the operations area are those with approval from the Indonesian army, and very few of these journalist have actually ventured into the area. Stringers for West Papua Media in Puncak Jaya and the Baliem Valley have reported that independent journalists and human rights workers have been prevented from travelling into the area by a de facto Military Operations Area being applied across the entire highlands, including the regional centre of Wamena. Wamena heading to Puncak Jaya this morning, with large numbers of troops patrolling the streets across Wamena also..
Thousands more troops flooding in to attempt to destroy Tabuni’s TPN. Thousands of heavily armed combat soldiers from Battalions 751 (Jayapura), 753 (Nabire) , and supported by the Wamena 756 Batallion, are reportedly being flown into Tingginambut over the next few days from several centres across Papua. They are joining together with over 1000 extra Brimob paramilitary police (in addition to the at least 1000 Polda Papua police already in the highlands), and allegedly several units of the notorious Australian-funded Detachment 88 anti-terror commando, to hunt for Tabuni’s forces. Several media reports in Indonesia are also claiming a Kostrad (Strategic Reserve) battalion is being deployed from outside Papua, though this has not been independently confirmed. Local sources have reported that each TNI platoon is accompanied by a platoon of police, as the operation is officially under control of the Police as a “law enforcement” operation. However, the witnesses have reported that the TNI are clearly in command. TNI spokespeople in Jakarta have told Indonesian media outlets that there is no plan to increase non-organic troop presence in the area, but local sources are reporting a vastly different story. West Papua Media sources in Wamena observing the airport have confirmed that two TNI Puma Helicopters are involved in the operation constantly ferrying troops between Wamena and Tingginambut, and stopping only for refuelling and crew changes. Three Hercules c130H aircraft have each made 3 drops to Wamena then the troops have entered by road from Wamena. Observers in Nabire have also noted daily departures of three trucks of troops from the notorious Battalion 753 Nabire, to the west of the highlands to reinforce the offensive in Tingginambut. Human rights and church sources in Puncak Jaya and internationally have expressed deep concern about the potential for heavy civilian casualties to occur with the intensified military campaign, given extra impetus after the Indonesian President, General Susilo Bambang Yudoyhono, called for firm action on Tabuni. The exact circumstances of the deaths of the eight Kopassus special forces soldiers are now mired in claim and counter-claim, with soldiers’ personal accounts of the attack conflicting with the official narrative picked up by Jakarta media. What is confirmed is that the eight commandos – Sertu (Chief Sergeant) Udine, Sertu Frans, Sertu Romadhon, Pratu (Private 1st class) Mustofa, Sertu Edy, Praka (Chief Private) Jojon, Praka Wempi and Sertu Mudin – were killed by a cascading attack led by guerrillas of Goliat Tabuni’s TPN group as they went to the Sinak airstrip to collect cellular monitoring equipment designed to track international phone communications in the area. However, one survivor of the attack testified in the Jakarta Post that his group was attacked by men, women and children all carrying spears, machetes and knives. According to the TNI survivors as relayed to JP, the platoon of Kopassus was unarmed at the time of the attack, which happened as the soldiers were installing and moving communications monitoring equipment. TPN forces also opened fire on a Puma helicopter that was evacuating the wounded commandos, lightly injuring three helicopter crew. “Apparently they have been trying to find out the whereabouts of these weapons, which suggests they might be too heavy to quickly and easily move,” explained the source. Further investigation is still required, but credible observers in the area believe that these heavy weapons may be artillery pieces – the presence of which in Puncak Jaya represents a serious and dangerous escalation of TNI hardware to be used against civilians. West Papua Media believes any confirmed presence of artillery is connected with the TNI’s stated aim to destroy Goliat Tabuni’s group, but any use of these weapons will place a large number of civilians at risk. It is not the first time the TNI have used artillery against West Papuan civilians: the Bloody Wamena massacres of 2000 and 2003, as well as the aerial bombardment campaigns in the 1977 and 1984. The killings of the soldiers have generated outrage in Jakarta, with nationalist politicians calling for cordon and destroy missions in what human rights observers have said amount to collective civilian punishment by an occupying force. Indonesian Deputy Defence Minister Lieutenant-General (LG) (Rtd) Sjafrie Sjamsoeddin – indicted as a war criminal by the UN for his role in East Timor – on Friday ordered the TNI to conduct heavy “tactical actions” in order to prevent the shooting from occurring again. “The tactical action includes to chase, apprehend and destroy,” the deputy minister said here on Friday. 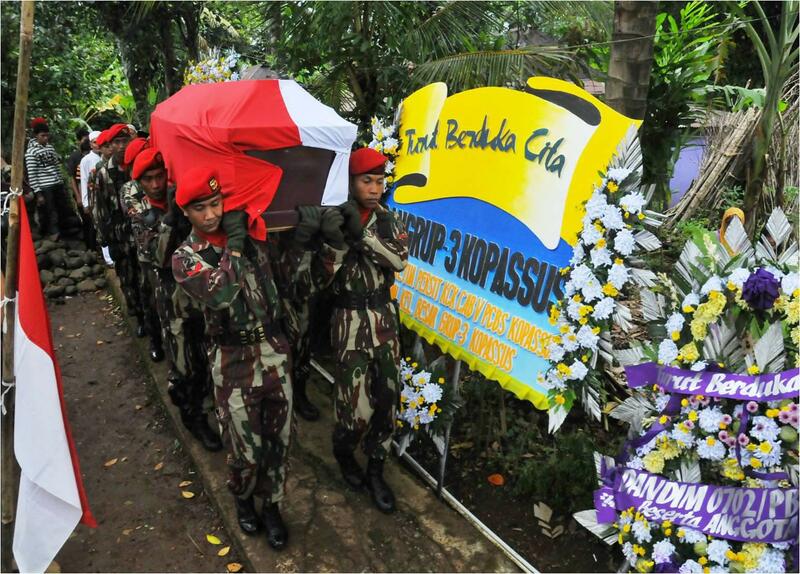 He said the latest shootings by the separatist rebels did not affect TNI`s strategic policies in Papua. 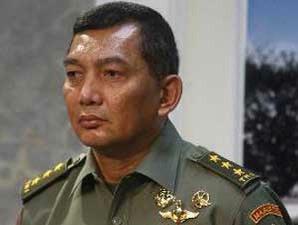 TNI so far did not have a plan to send more troops to Papua, he added. However SBY also claimed in an interview with MetroTV that “no violence” would be used to solve the situation. The situation on the ground has illustrated that security forces have no interest in making SBY’s words truthful. Despite the nationalist rhetoric, there are many in Indonesia who are seeing this as a wake up call to end Jakarta’s use of state violence against civilians in Papua as it default policy. The Indonesian Regional Representatives Council, or DPD, called for a necessary cessation of military operations to end the prolonged violence in Indonesia’s easternmost provinces, according to a report in the Jakarta Post on Wednesday. The presence of the non-organic personnel from TNI special forces cause animosity among Papuan groups, who have launched attacks against them, according to the report. “If Jakarta wants to end violence, the militaristic approach has to stop, and all non-garrison troops from the military elite forces must be withdrawn from the two provinces because their presence and their irregular operations have triggered attacks on garrison troops and innocent civilians,” DPD deputy chairman Laode Ida said on Tuesday. A coalition of Papuan human rights groups urged the National Commission on Human Rights (Komnas HAM) to conduct a thorough investigation into the soldiers’ killings, saying the presence of Komnas HAM could prevent human rights violations that occurred during TNI sweep operations after shooting incidents, according to a report in the Jakarta Globe. “We encourage law enforcers to be professional in carrying out their tasks. They must ensure that their attempts to find the perpetrators do not turn into seeking revenge against all Papuans,” Ferry Marisan from the Institute for Policy Research and Advocacy (Elsam) said in Jayapura on Monday. The TNI has loudly complained in Indonesian media of hurt feelings about the loss of its soldiers, with the National Human Rights Commission (Komnas HAM) leaders have been forced to apologise for “insensitive” remarks saying killing soldiers is not a human rights abuse. But not all observers are showing sympathy for the loss of the soldiers lives, pointing to the fact that the military are occupying Papuan land against the wishes of the local people. Still, other observers believe the actions point to an assertion of tribal identity, as a complex motivator behind the declaration of Papuan sovereignty inherent in the armed resistance against Indonesia’s militarist policy in the highlands. An Australian church worker who worked for many years with highland communities in Puncak Jaya made the observation to West Papua Media that this was not simply an act of resistance to Indonesian colonisation, but an assertion of traditional and indigenous Papuan law and cultural survival against the onslaught of an occupying colonial army. “This must be looked at from another perspective that is relevant. As many indigenous communities including Australian Aboriginal Peoples and traditional highland Papuan people, observe around the world, if outsiders came into their sacred lands, they would also feel compelled at whatever cost to themselves to spear the outsider to compensate (violations of) their traditional law if they belonged to the clan that was legally responsible (under customary law) to guard that site,” she explained. “Indigenous Law is simply not negotiable on things like that. Things have only changed in Australia because non-Indigenous systems have for years now in Australia been locking up those indigenous peoples who have acted to maintain their law,” the former church worker explained. A prominent Papuan human rights activist, Yasons Sambon, has reported that the killings are causing many military families to reconsider their support for the Indonesian colonial occupation of Papua. In an interview with the wife of one of the eight soldiers killed at Sinak, recorded on February 23 after the soldiers funeral in a car by the old market in Sentani, the widow called for Indonesia to abandon its occupation of Papua. “It’s better if independence is given to the people of Papua so that we can be safe,” she said. 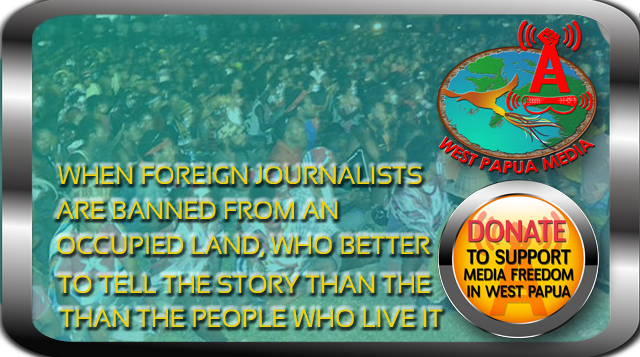 *from the West Papua Media Editorial team, with additional reporting from stringers in Wamena, Tingginambut, Jayapura, Nabire and sources in Jakarta. Indonesian government strongly supported by America and its allies in the west block then should we [Papua] joined the Russian federal government so quickly achieved independence process …. 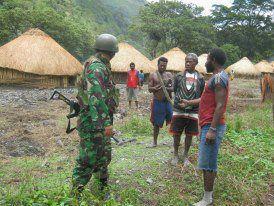 that’s what we [the younger generation of Papua] strive now !